Anna Elizabeth Allen, The Pier, St. Petersburg, circa 1935. Oil on board, 18 by 24 inches. The Orange City Village Improvement Association published the following regarding Anna Elizabeth Allen: “Elizabeth Allen, after graduating from the Boston Art Institute, taught art in various public schools in Massachusetts, at the same time studying with outstanding New England artists. In Orange City she conducted art classes besides having many private students. She was chairman of the art department of the Village Improvement Association for many years and arranged many of its art exhibits. As an artist, Elizabeth Allen was a landscape painter of the realistic school. She had a fine picture sense and never hurried in selecting her point of view. She loved the Florida scene and painted in every direction from Orange City: The Atlantic Ocean at Daytona, with its vari-colored beach, its sand dunes and scrub palmetto; shrimp boats and the high round arch in the ruins of the old stone mill at New Smyrna; a rustic bridge at Juniper Springs; the great water wheel at Ponce de Leon Springs; the bowered circle of Green Spring; the dark opalescent sulphur water at Blue Springs Run with its boat houses, its stretching cabbage palms and reaching live oaks; the towering pines on Stone Island; the craggy cypress lapped by Lake Monroe; the wooded islands across the St. John’s River, with a clump of water hyacinth or an old row boat moored on its shore. Live oaks and water oaks, citrus trees and palm trees and pine trees, long vistas of them or standing singly in their inherent beauty, and over all – the sunny clouds and blue sky – Elizabeth Allen loved them all! Her palette was loaded with ‘happy’ colors, reflecting her own gentle happy temperament. Never did she paint the turbulent, the foreboding or fearsome in nature, and never with a heavy brush. Rarely did she place a figure in the scene to distract from the message, tree and sky could tell so calmly. A distant building or an intriguing doorstep might enter, but only to highlight the shady path and sun-filled treetops leading to it. Gardens were always a delight and many homes in Orange City proudly display their garden painted by Elizabeth Allen as a generous gift. She was a trained and disciplined artist and, although she never claimed to be a portraitist, one of her most moving paintings is a commissioned ‘Ascension’ for the First Methodist Church at Titusville. In the high arch behind the pulpit, its majesty and compassion rising in an aura of sunlight, friends consider “The Ascension” her masterpiece. Elizabeth never denied it. When the new Methodist Church was built, ‘The Ascension’ was placed in the focal point of the adjoining Hennessey Hall where its message can still be shared. Born: January 1879, Worcester, Massachusetts. Education: Massachusetts School of Art, Boston; In Ogunquit, Maine with Charles Woodbury; with Hugh Breckenridge in Gloucester, Massachusetts; Valentine Henneman; Boston Art Institute. 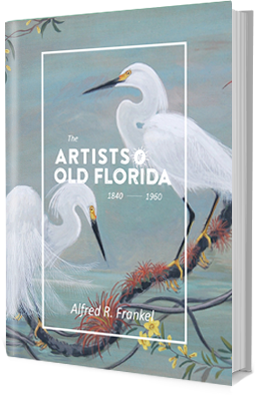 Membership: Orlando Art Association; Florida Federation of Arts, Southern States Art League; Gloucester Art Association.